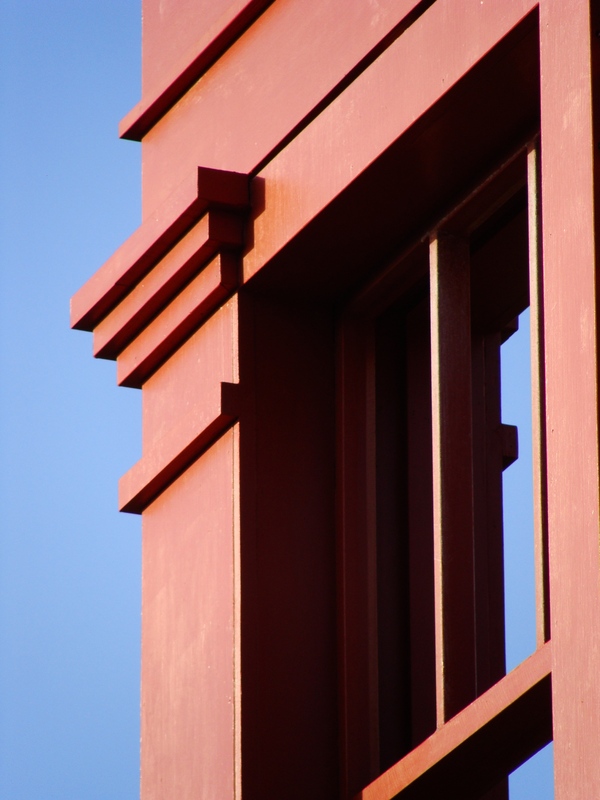 Precise lines and angles: art or architecture? Sue’s word this week is angle and I confess that in true journalist fashion, I’m using the theme as an “angle” to write about something I saw recently, that I think is very cool. In Wellington recently, I walked to the top of Cuba Street to take tea at Martha’s Pantry. This cool little tea shop is on the corner of Cuba Street and Karo Drive and sits next door to Subject to Change, a sculpture by Regan Gentry. Subject to Change; a sculpture by Regan Gentry. 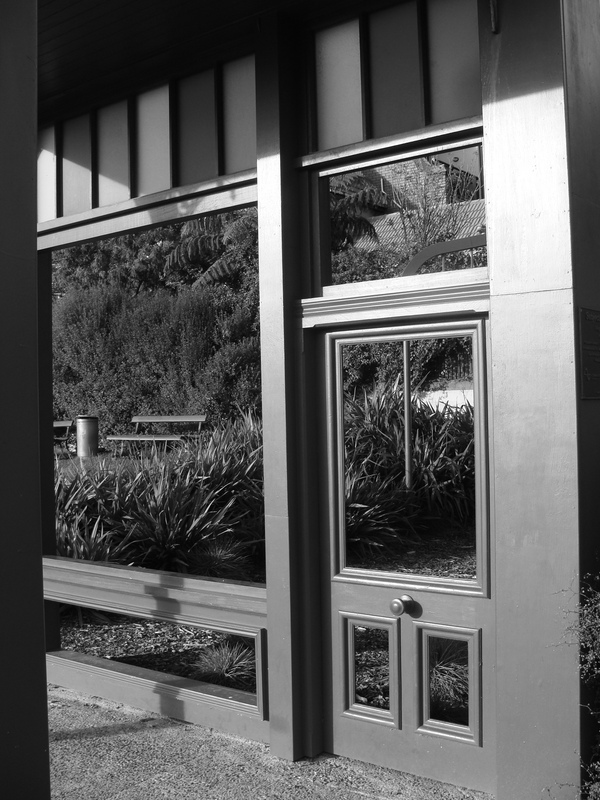 Subject to Change is the steel skeleton of two walls of a heritage-type Victorian or Edwardian New Zealand building, such as used to occupy the site where the sculpture now sits – before that area was cleared in the construction of a new motorway. It looks like a slice of a building left behind by the developers…tenuously existing on the edge of the new motorway. It mimics components and colour schemes of the buildings that are or were around it, to integrate it within the historical and contemporary context of the area. Detail of Subject to Change, a sculpture by Regan Gentry. Subject to Change is beautiful. 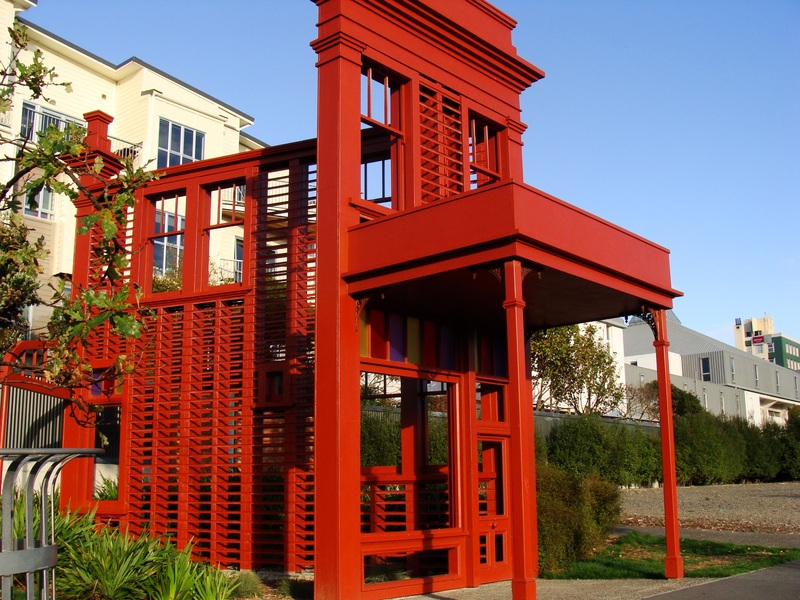 I saw it on a clear, sunny morning when the vibrant red of the structure stood out against the muted colours around it. It is strong and powerful and clever and a poignant reminder of the heritage we destroy in the name of progress. So focusing on pathways is an interesting concept for me. Afterall, pathways exist to go somewhere and I have probably always been too busy thinking about that somewhere to capture the road I’m on. Then I found the photo above of an installation at the New Plymouth Festival of Lights. You could say that it’s connection with pathways is a bit tangential, and maybe that’s true, but it got me thinking about how light itself is a kind of pathway.By illuminating some things and leaving others in darkness, light creates a way forward – a direction. The photo above was taken in Federation Square, Melbourne, in June 2009 during the annual Light in Winter Festival. The sculpture consisted of this series of columns each of which lit up at different times, in different colours. Arranged in a grid, the columns formed multiple, transient pathways, based on the timing or the colour of the lights. In this photo, the pathway could be seen to lead to St Pauls Cathedral opposite Federation Square on Flinders Street. Churches have traditionally been a source of light – both actual and spiritual. Many different pathways can take one to church. I don’t really believe in God, but within the large, elegant churches of the more established forms of Christianity, I find peace and beauty and joy. I experience these things not because of any belief in a supernatural being, but because they represent some of the highest forms of human creativity; in architecture, design, painting, sculpture and music. On a wet and bitingly cold winter’s night, St Patrick’s Cathedral in Auckland is a place of sanctuary. A path of gleaming white leading to the sacred space within which music, ritual, tradition and visual harmony embrace believers and those of us who are content to celebrate the genius of humanity. The religious music of John Rutter embodies for me much that is truly good in humanity; a pathway to joy. I guess like a lot of people, my first response to this week’s Daily Post photo challenge – escape – was a vision of a tropical island (Tahiti probably). And we are in the process of trying to organise just such an escape for the next school holidays. But while holidays on beautiful Pacific islands are a real, but infrequent form of escape, my first and best refuge has always been books. This photo isn’t of my all-time favourites, nor even the books I’m reading at the moment. It’s a pile of some of the books I have escaped into at sometime during my life. The size of the pile is determined by the composition of the photo, so don’t try to read more into it than that. If I had the time (and all of the books) my escape photo would be of something that looked more like a hut made entirely of books. But I think that’s called a library. Defining nationhood: we are what we eat? Cheap and easy to make, delicious to eat. If they make it into a biscuit tin in our house, it means the boys are unwell. 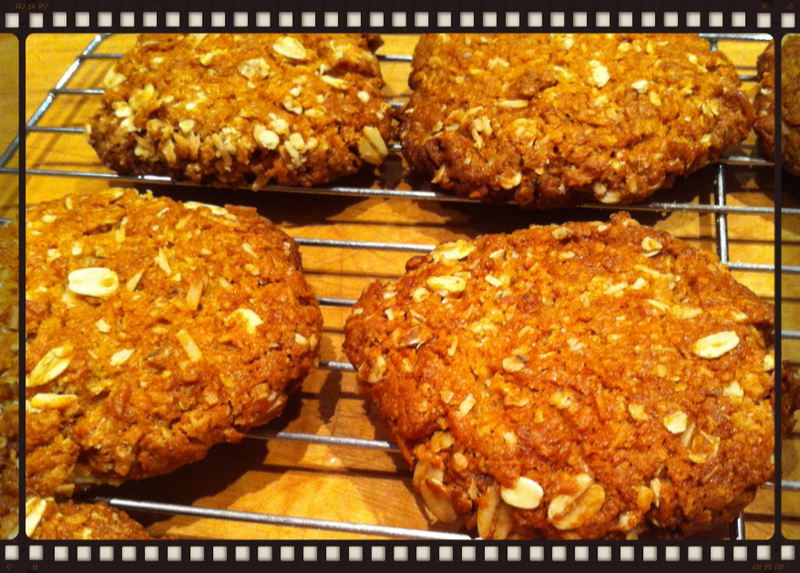 First of all, thanks to Seonaid at Breathofgreenair for inspiring me to write this post with her comment about Anzac biscuits on my recent post about Anzac Day and remembrance in New Zealand and Australia. 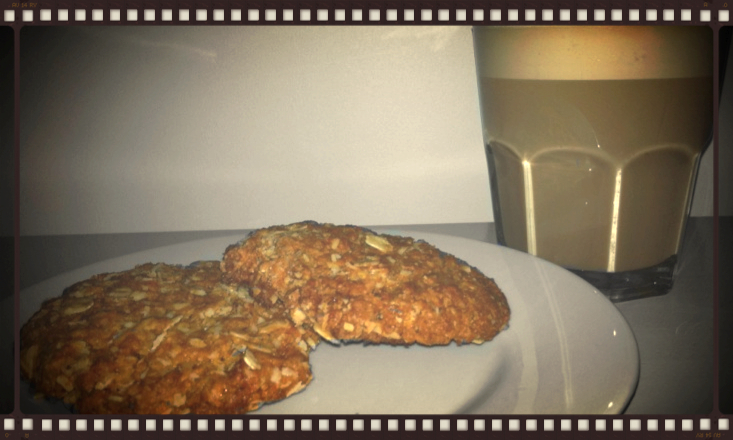 For those of you who don’t know – Anzac biscuits (think cookies North American readers) – are a delicious sweet biscuit made with flour, rolled oats, coconut, butter, sugar and golden syrup. Legend has it that the biscuits are so named because they were sent by women in Australia and New Zealand to their men-folk serving in World War I.
is essentially a long shelf-life, hard tack biscuit, eaten as a substitute for bread. Unlike bread, though, the biscuits are very, very hard. Some soldiers preferred to grind them up and eat as porridge. The combination of the name Anzac and the recipe now associated with it first appeared in the 9th edition of St Andrew’s Cookery Book (Dunedin, 1921) under the name “Anzac Crispies”. Subsequent editions renamed this “Anzac Biscuits” and Australian cookery books followed suit. ANZAC biscuits are commercially available in Australia and New Zealand, but frankly I don’t know why anyone would bother to buy these when they are so cheap, easy and quick to make. In fact, here’s a recipe. Preheat the over to 160 degrees Celsius. Mix the flour, sugar, coconut and rolled oats in a bowl. Stir the baking soda into the boiling water, then mix the butter and baking soda mixtures together (NB: either do this in a new bowl, or make sure you’ve melted the butter in a large pan as the mixture bubbles up. I find that adding the baking soda to the butter then immediately pouring this over the dry ingredients works fine). Roll teaspoonfuls of the mixture (NB: I use a dessert spoon for bigger biscuits) into balls and place on well-greased or baking-paper-lined oven tray. Press flat, allowing room for them to spread. Bake for 25-30 minutes (NB: maybe my oven is hotter, but I find they are cooked after 15-20 minutes – even the larger biscuits I make). * This recipe comes from Jo Seagar’s All Things Nice. 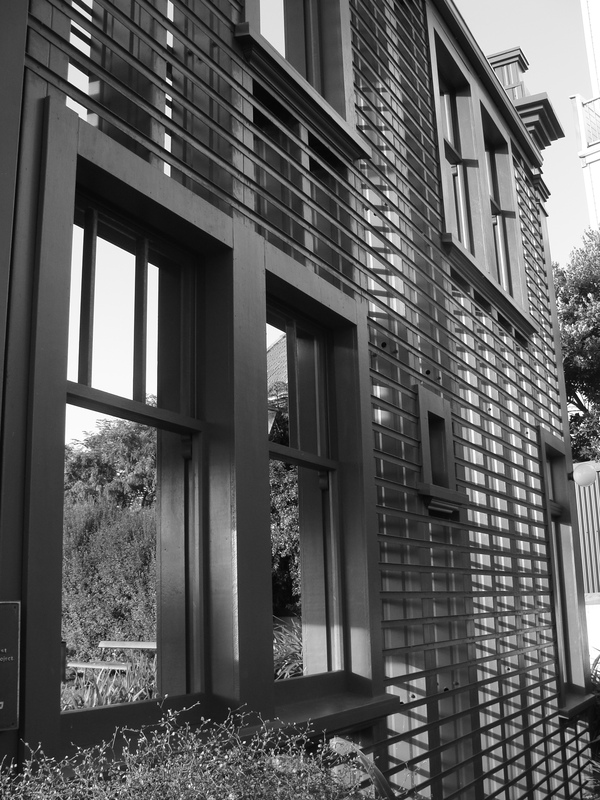 Random House, Auckland, 2002. Latte and biscuits. I didn’t actually eat both of them; that’s just my attempt at food styling.